Long time, no see! Hopefully now that the PhD is 99% done I’ll have more time to post here. 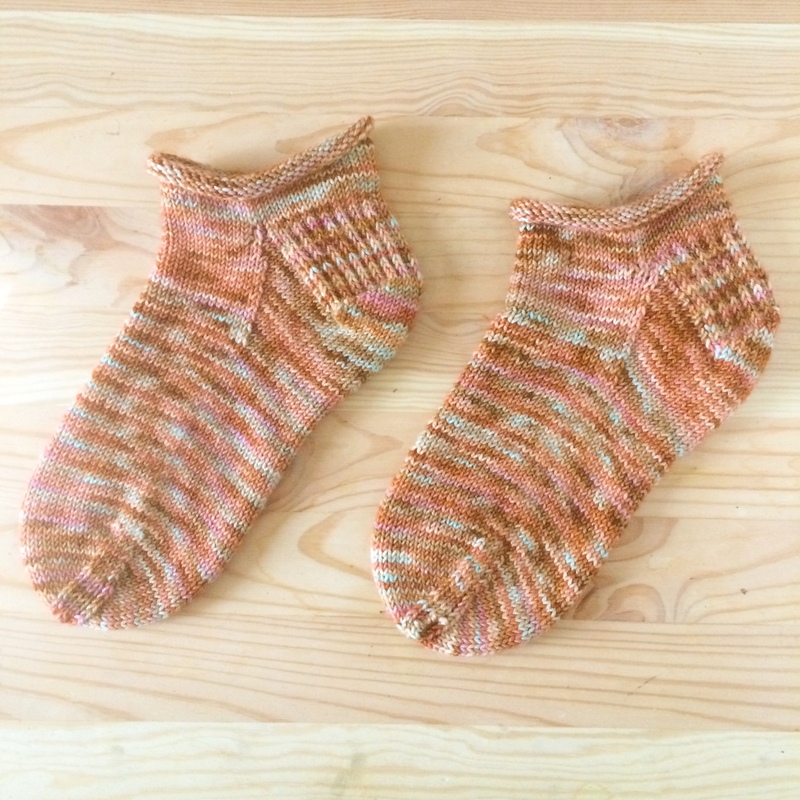 Today I wanted to talk to you about my newly found love of self-striping sock yarn. It’s no secret that I’ve been obsessed with knitting socks since I knit my first pair, but despite my love for stripes I wasn’t convinced they would work well in socks. I finally took the plunge when my amazing friend Carol, AKA Havirland dyed her first batch of self-striping yarn. The question was how to approach the heel. There are many kinds of heels one can use in socks. I typically knit mine top-down using a heel flap. But instead of going that way, I took the opportunity to learn the afterthought heel. The result is pictured below. Yarn: Havirland Pax Sock “Ecto Floral” self-striping. Pattern: top-down sock, 56 stitches in 2.25 mm needles, afterthought heel. I like the look of this heel but unfortunately it doesn’t fit my feet as well as a traditional heel flap, so for round 2 of self-striping I chose to knit socks with a flap. I happened to have some “Lady Orange” yarn also from Havirland, so I was able to match it to the orange of one of the stripes in “Godzilla in Paris”. I get 8 stripes per color for this yarn so I knit 4 rows, switched to Lady Orange and knit the heel, gusset and decreases. I then switched back to the main color. The result is pictured below. Yarn: Havirland Pax Sock “Godzilla in Paris” with a heel in “Lady Orange”. Pattern: Top down, 56 stitches in 2.25 mm needles, coordinating heel. I love this combo! However, it is unlikely that I’ll always have yarn to coordinate with my self striping, even considering my huge Havirland love. So I also knit a sock with a regular flap heel, knit continuously with no extra yarn whatsoever and only 2 ends to weave! The result is pictured below. Pattern: top-down, 56 stitches in 2.25 mm needles, traditional heel flap. 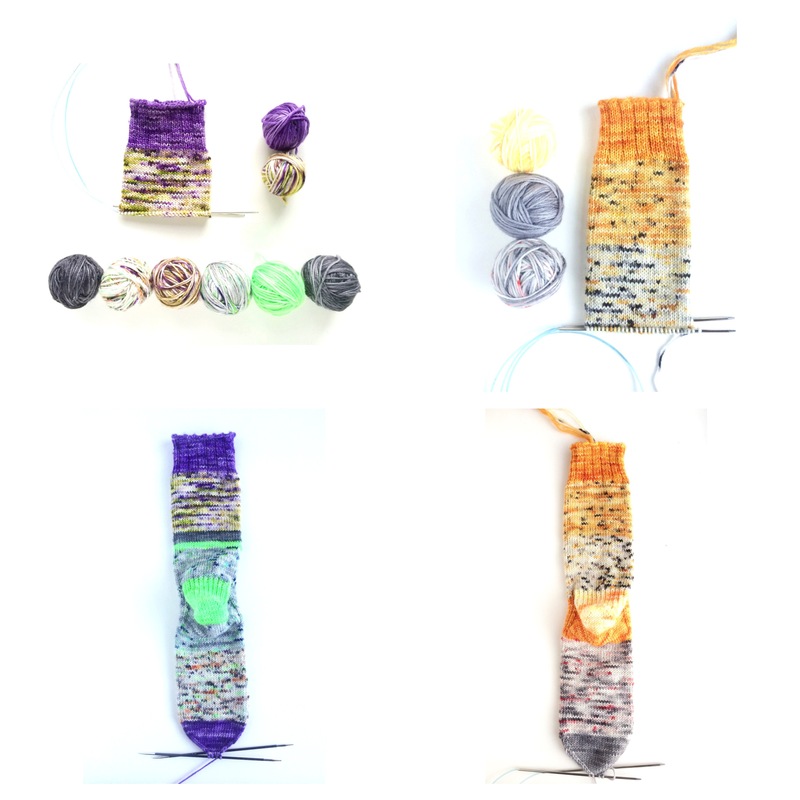 I hope this experiment is useful to you if you decide to take the plunge into self-striping yarn. Let me warn you, it’s addictive! 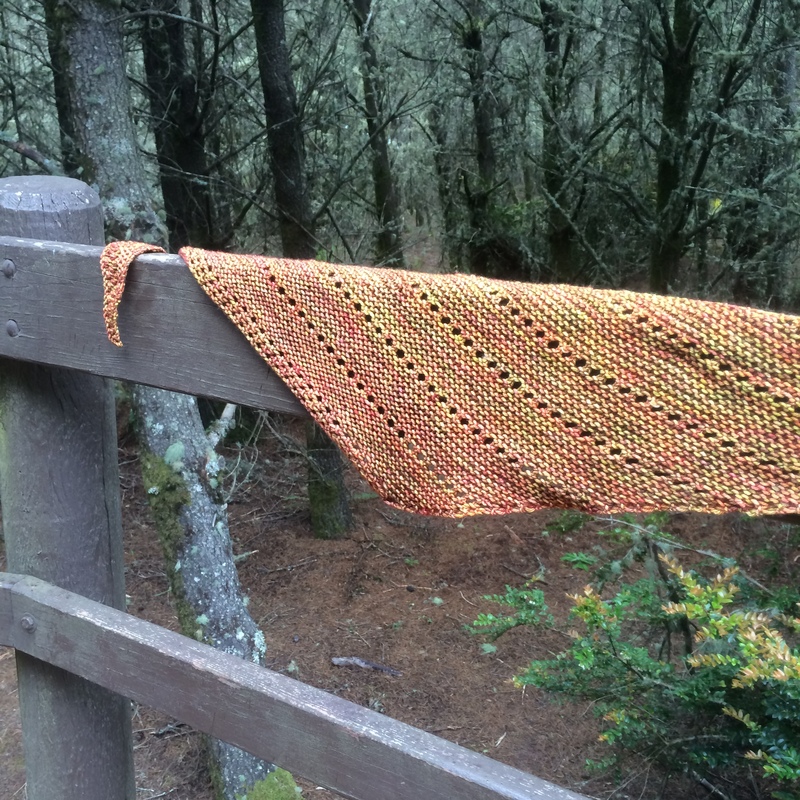 Although I knitted this shawl for Halloween, it’s the perfect accessory for yarn minis you may have accumulated or want to buy. Mine was made with Havirland Yarns Halloween minis and some folks on instagram (@nanoadri) have asked for the pattern. A couple months ago I knit my first sock. It was difficult and I was not convinced I was really into it. A lot of patterns are cumbersome and don’t properly explain why or how one goes about making a sock. Then came the ‘Rose City Rollers’. A simple, well explained, addictive and FREE pattern by a lovely lady who inspires me on a regular basis, Mara, aka Orangeknits. The rollers made me fall in love with sock knitting. I am told this happens quite often. 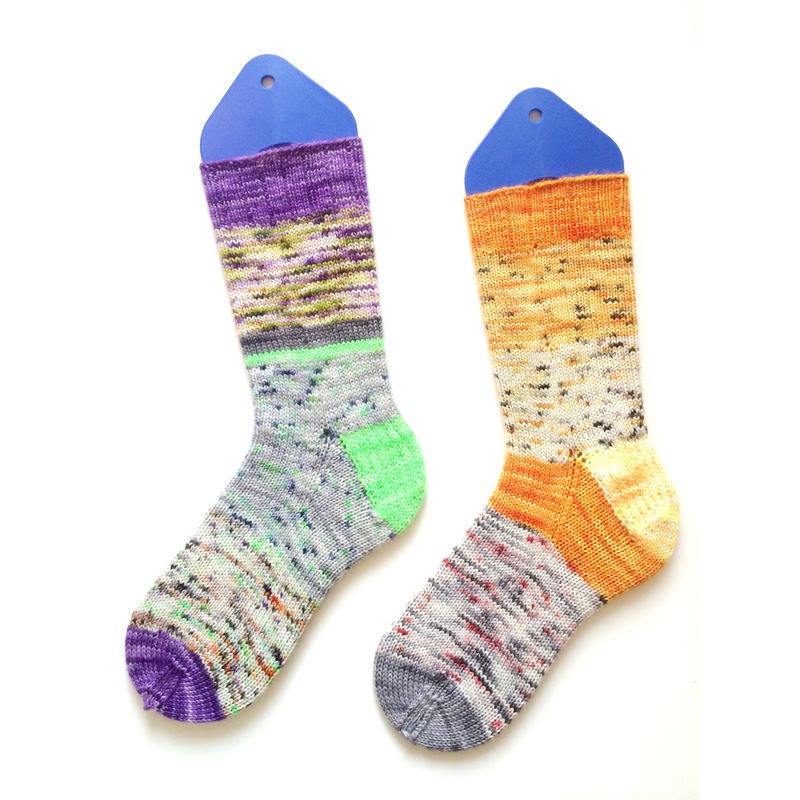 Weird as it sounds, making socks to me is like making protein. When I am frustrated in the lab because new experiments won’t work, I make protein. I still remember my first prep, which took me forever and seemed extremely difficult. Now it’s one of those few things that bring me instant gratification. Socks have become the go to knit for when I’m feeling uninspired or simply too exhausted to take on a complicated pattern. I’m a fan of simple patterns that highlight amazing yarns. One of my current favorite dyers is Havirland, aka, Carol. She’s another one of those wonderful people I’ve come to know through instagram (yay for good social media). Her yarns are fun, unique and often pretty nerdy. She is as much a fan of Halloween as myself and so she makes fantastic spooky color ways. When I saw her Halloween minis set, I knew I had to get it and make a pair of socks with it. I consider these socks to be the best thing I’ve ever knit. 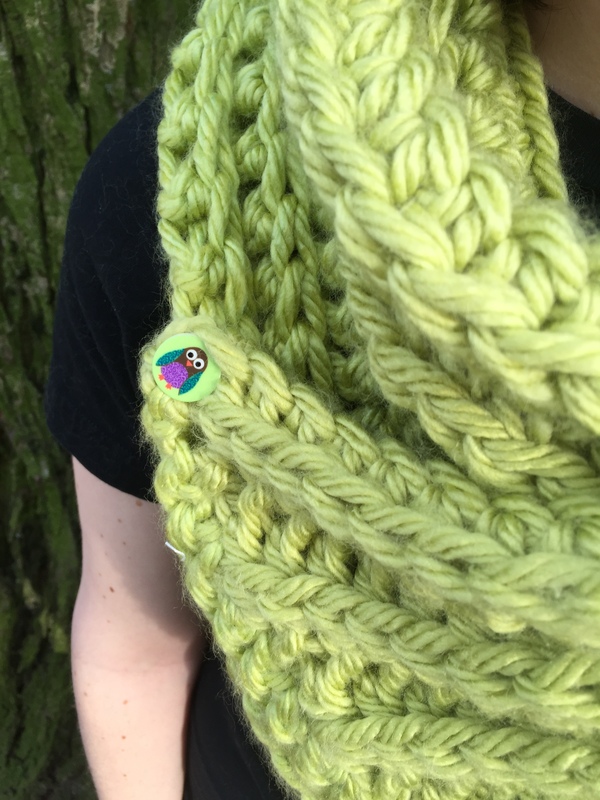 Not just because I’m extremely happy with the final product (see first picture), but also because they made me realize I can actually combine colors/variegated yarn in a pleasant manner. – I have always told myself and my husband, I had no idea how to combine colors. I called it being ‘color impaired’. But no more. I am now ready to tackle a million more colorful projects and see where my instincts take me. In the meantime I’ll dream of Halloween. PS. My halloween socks are 56 stitch rollers with a longer leg (7 inches) and a 3×1 ribbed cuff that measures about 1.5 inches (20 rows). Life has been a bit insane as of late. Grad school is at the final stages. The hubby moved to Maryland for a job. I have been working as much as I can and eating and knitting during every single little break. As a result, here are 3 shawls and a delicious cornbread recipe that I have now made a dozen times and never fails. Variations are endless. 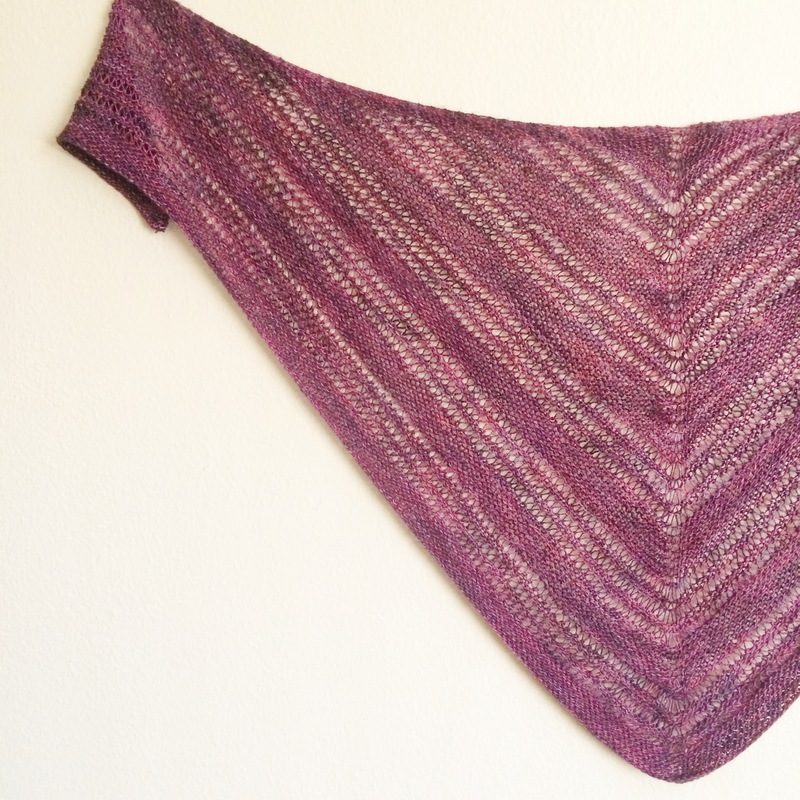 Finally, Neato shawl by Jumpercablesknitting. If you’re wondering why mine doesn’t have stripes of holes all the way across, it’s because I skipped row 13. 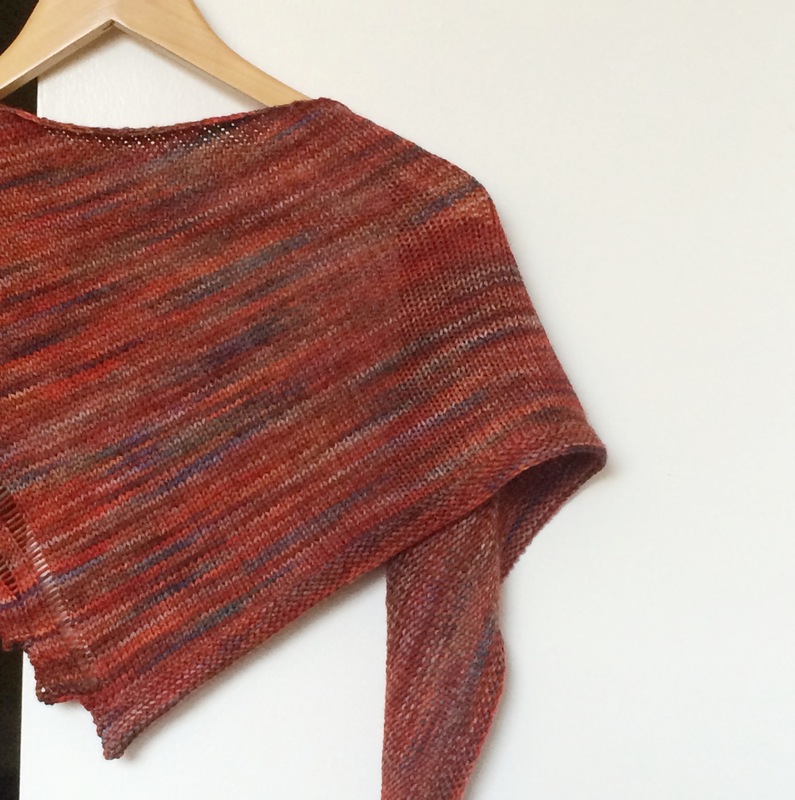 The yarn is Malabrigo arroyo in Marte color way. Absolutely love this yarn! 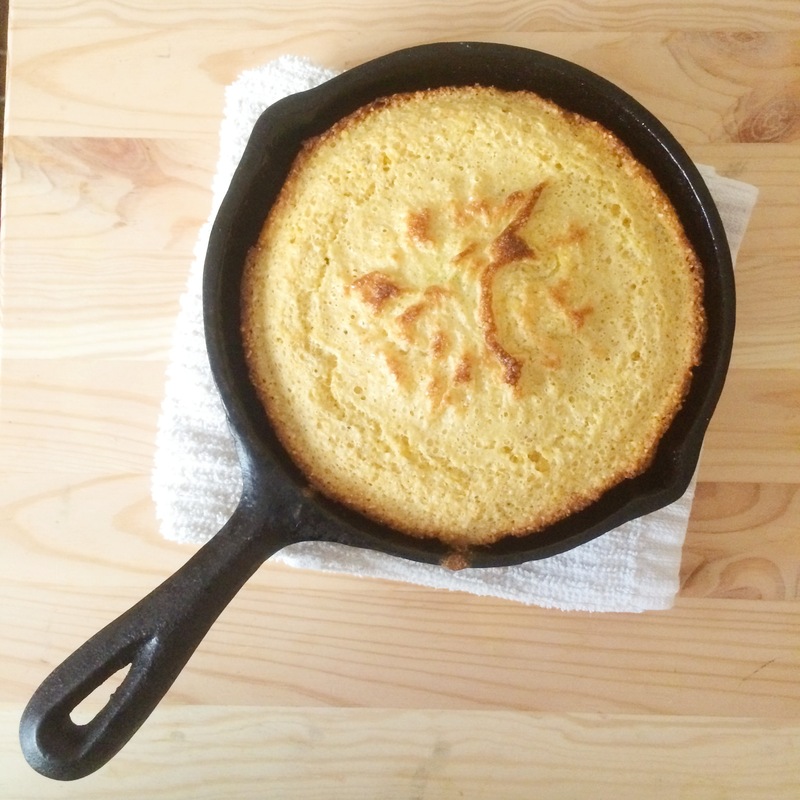 Last, but not least, Sean Brock’s cornbread. It’s out of this world good. Did you all have a good Easter last week? I hope so! I must confess I love American Easter. Why ‘American’ you say? well, the typical American Easter has little to do with the more religiously oriented Spanish traditions. In Spain you’ll find no bunnies, no Easter egg hunts or Easter baskets filled with goodies. Sounds a bit boring, doesn’t it? – A pot or pan to ‘cook’ the yarn and a container to soak it. *Note: you can dye your yarn in whatever shape or form you like. 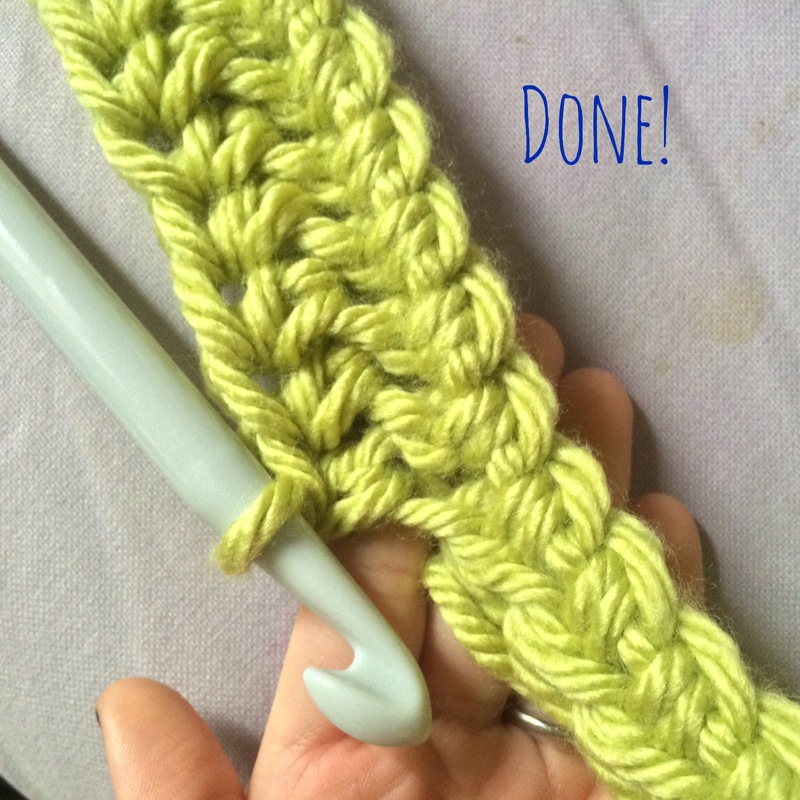 Most tutorials you’ll find out there use a skein that is made into a circle using a niddy noddy. I chose to dye my yarn this way because I wanted a variation in color between the inside and outside of the caked yarn. 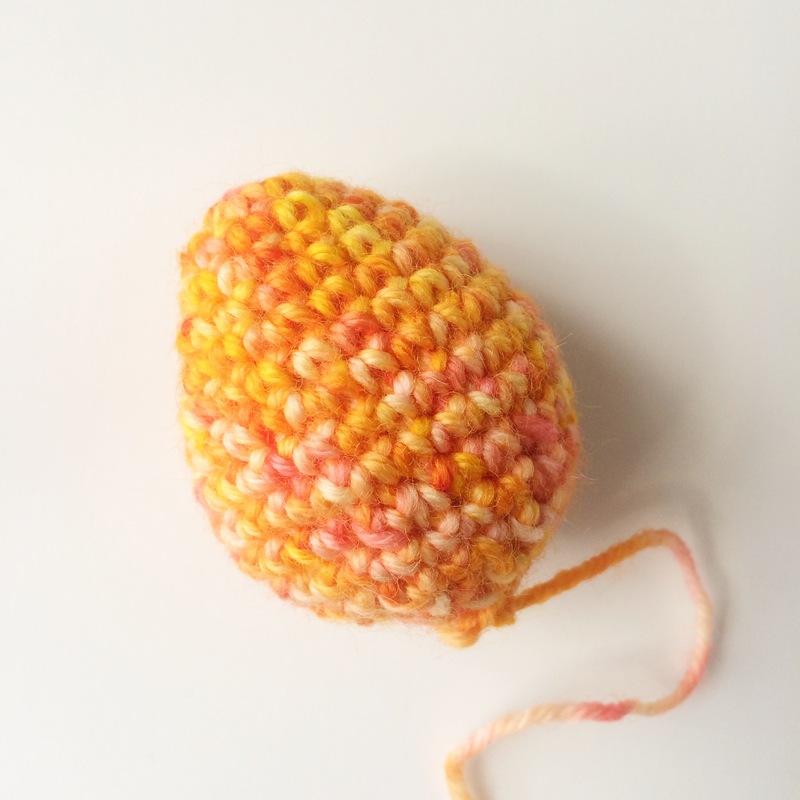 You may choose to keep the yarn in a ball or to make it into a circle. 1. 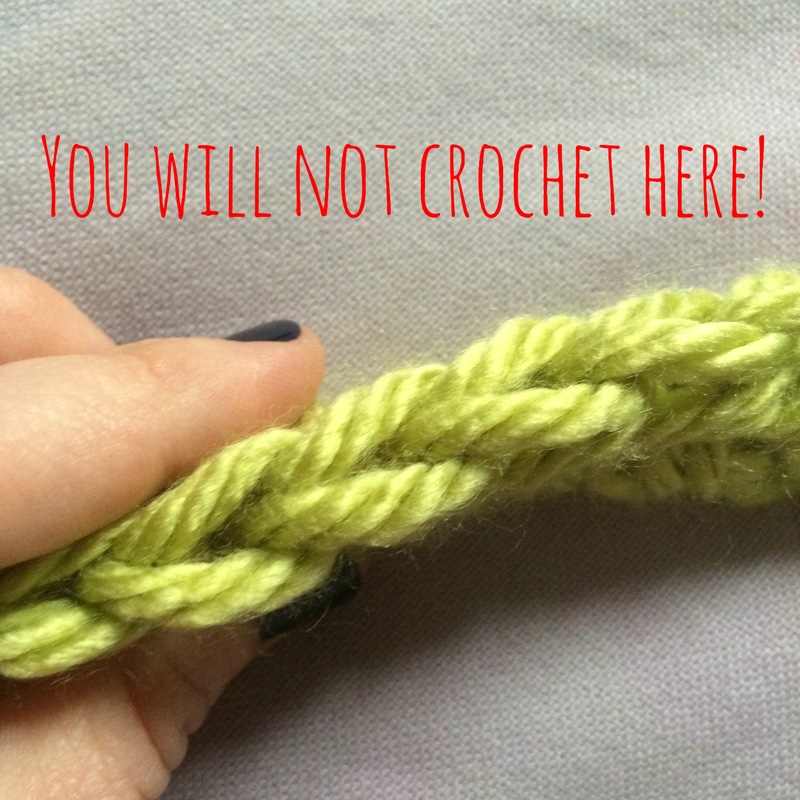 If you chose to cake your skein, do that first. 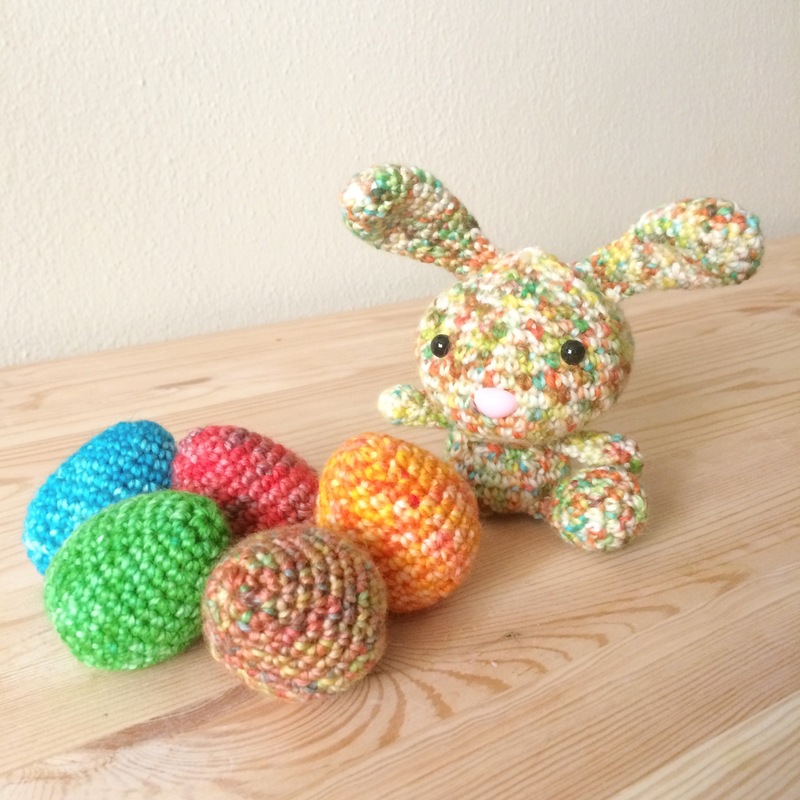 I used one of my skeins full, to be used for the bunny and the other I split into 5 mini-cakes to be used for the crochet eggs. 2. Soak the yarn in a water + vinegar. You will need 1/4 cup of vinegar for every 4 cups of water. The vinegar is absolutely required. Why? I will save you the exact chemistry but vinegar is an acidic compound. In order for the chemical groups in wool to react with the chemical groups in the dye, the pH of the yarn has to be low. That is, you need slightly acidic yarn. In order to achieve this you’ll want to soak the yarn for at least 30 min. 3. While you wait, mix your dyes. Keep in mind there is a limit as to how much dye will be dissolved in water. 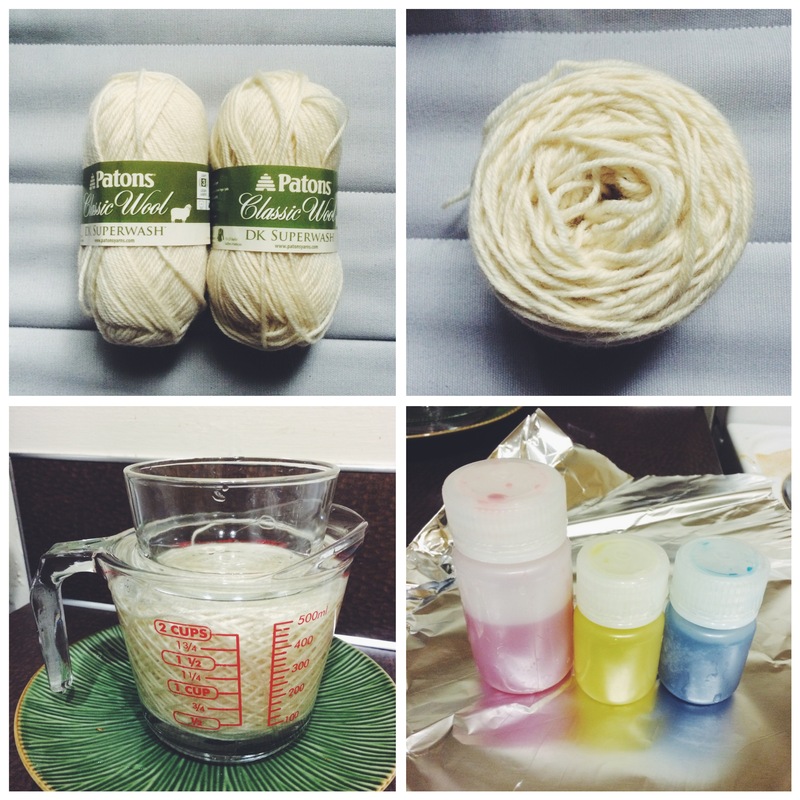 I made my dyes in saturating conditions. This means I add as much dye as the water can dissolve. This gives very intense colors. I mixed my dye and water in small bottles I have, but you can do it in any container you’d like. 4. Add the dye! For my speckled yarn, I added teaspoons of dye mixture in a more or less evenly distributed manner. Starting with the darker colors and finishing with the light ones. You may choose to do this in a different order. 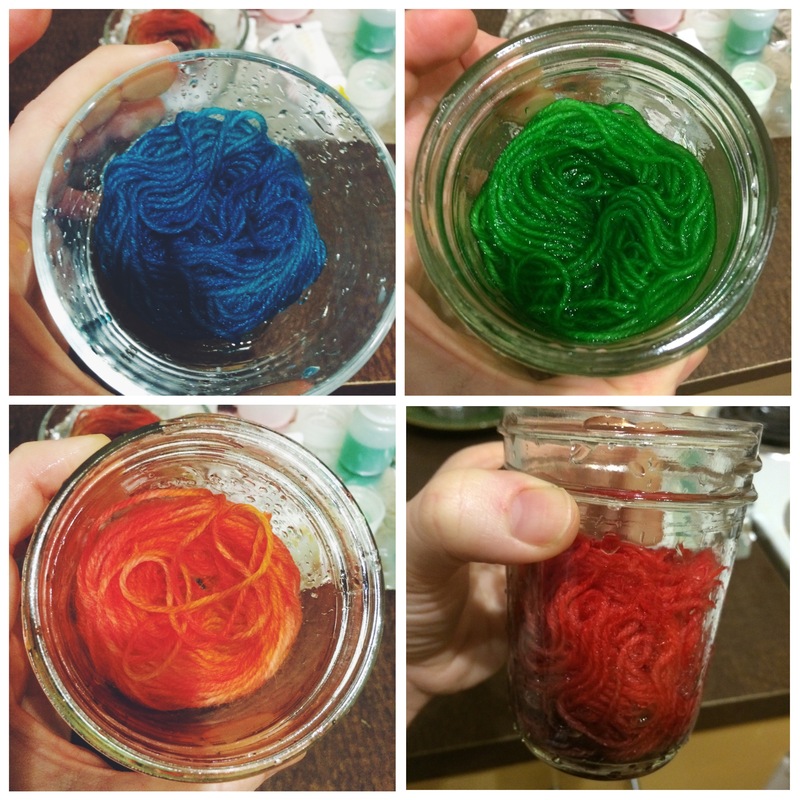 For the single color yarn, I placed my mini cakes in small mason jars and poured the dye on top. When I was satisfied with the color I poured the dye off and filled the jars with clean water. 5. ‘Cook’ your yarn. In order for the dye to remain chemically attached/linked to the yarn, it is necessary to increase the temperature of both. 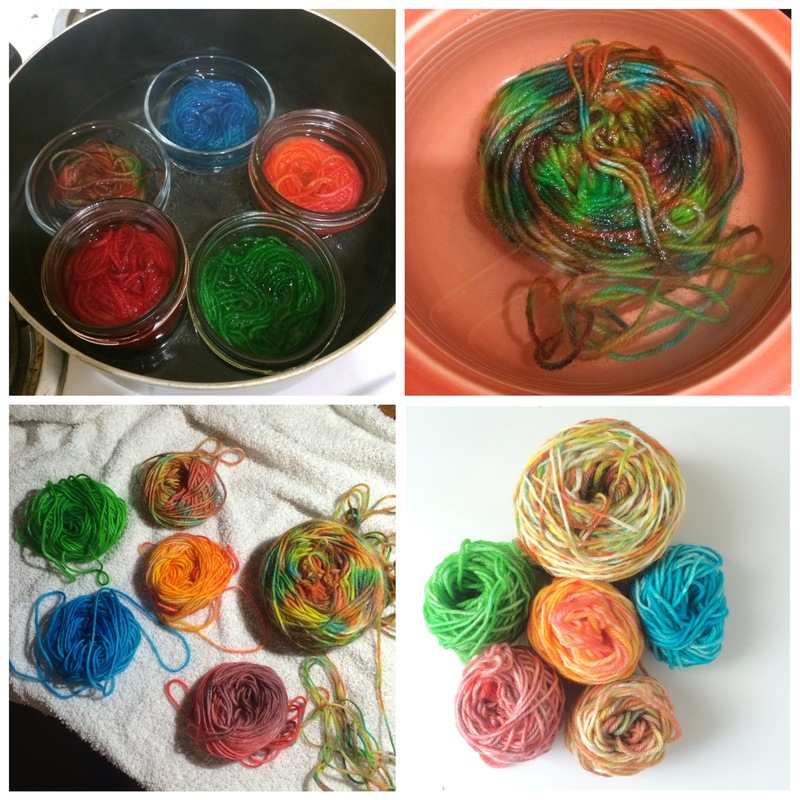 We do this by placing the yarn directly in a pot with water (that’s what I did with the speckled yarn) or by placing it in jars that are then placed inside the water (top left corner picture). I reacted my yarn for 1 hr at 170F / 90C. Right below boiling. You want the ‘cooking’ process to be gentle so the yarn doesn’t felt. 6. Once the yarn is dyed, rinse it with cold water. I chose to also soak it in water with a tiny bit of Eucalan/hair conditioner. I really do mean a tiny bit. This will fix any slight felting that may have occurred during the dyeing process. 7. Let the yarn dry! I let my small cakes dry wrapped in a towel (bottom left picture) and the large cake spread over the towel. You’ll want to aim for an overnight dry. 8. 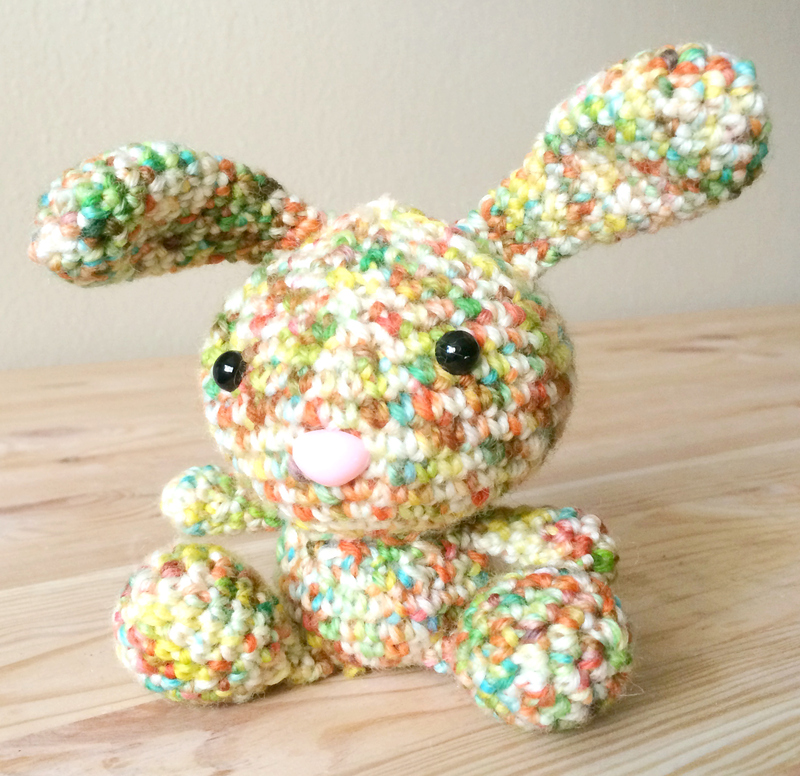 Make your bunny and eggs or whatever other colorful creation you’d like. It is no secret that graduate students tend to be quite broke. It comes with the territory and there is no point in discussing the merits or faults of graduate stipends. We’ll leave it at, it’s not much. For that reason, buying nice yarn is a treat. Skeins are few and far between and thus, they are treasured. One way to get good yarn for the right price are stash boxes. I bought a destash box from a designer a long time ago. 40$ for about 16 skeins of different brands and colors. Among them was a skein of Madelinetosh vintage. Then and there, I was in love. I have since bought a couple skeins of her yarn, been gifted 2 and enjoyed them all. 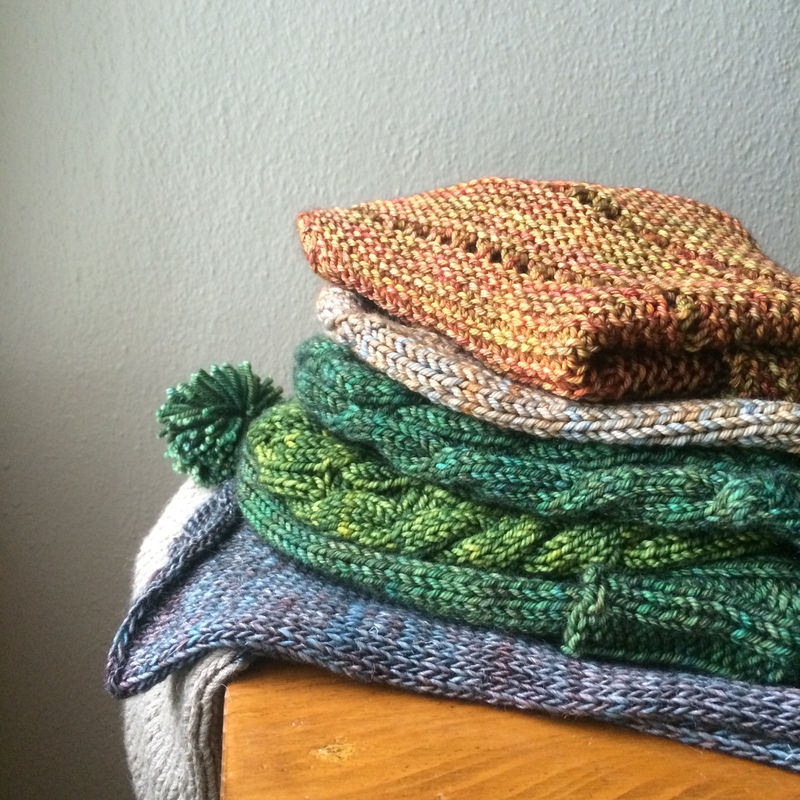 The resulting pile of Madtosh knits is pictured above. I must also mention that Madelinetosh yarn is purchased from fair sources in Peru and South Africa and hand dyed in Texas. Supporting Texas businesses is something I do because I married a Texan and I have had the chance to visit the state and meet lots of lovely people there. I am also a strong believer in buying Made in the USA and supporting small businesses. So this is a win win! Over the next couple of weeks, I’ll be posting about all these finished objects. Including an improvised pattern for the cowl at the bottom of the pile. But for now, let’s get started with some hats! 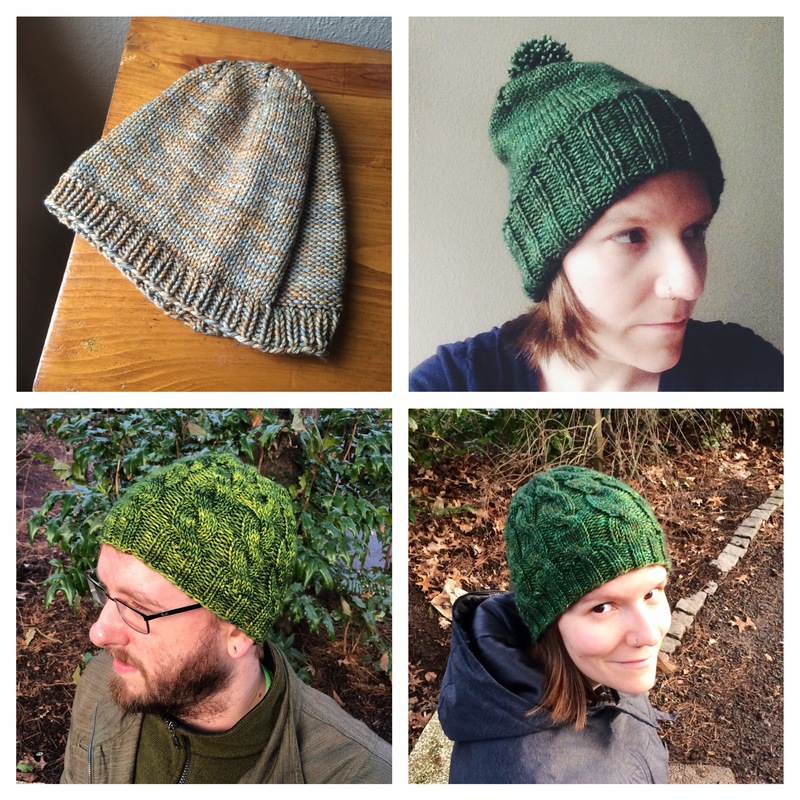 The hat on the left top corner was meant to be a Barley hat from Tin Can Knits , did I mention it’s a free pattern? 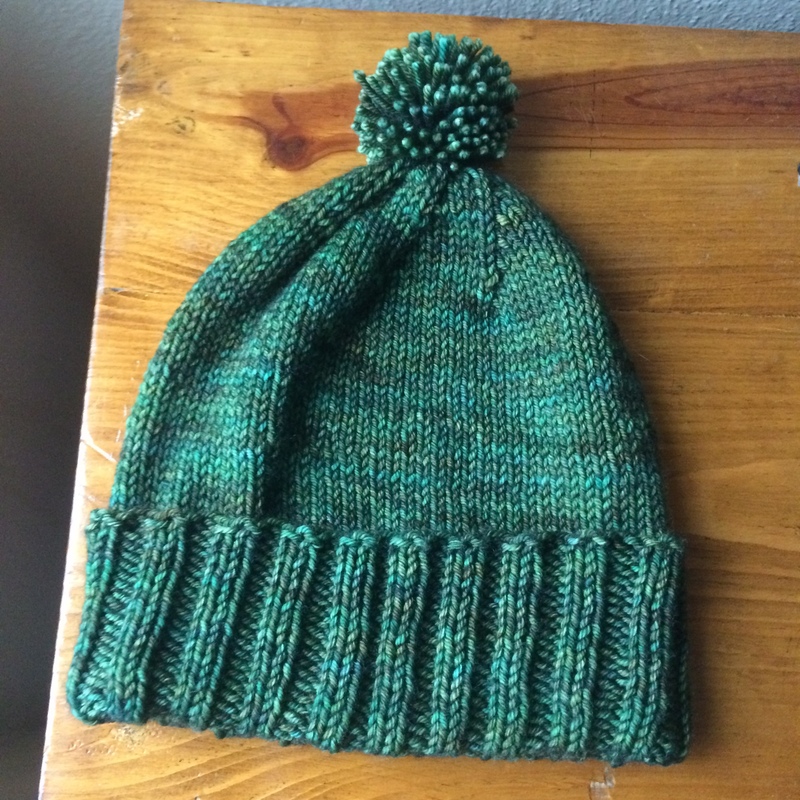 It was one of my first knit hats and I didn’t do the best job at following the pattern. Oops! That does not stop my husband from wearing it very often. The yarn is the skein I got from the destash box and it’s Tosh Vintage in Earl grey color way. The last two hats may look familiar to you if you follow the blog as I have posted about them previously. The one on the bottom left is the Close Cables Hat by Pickles. 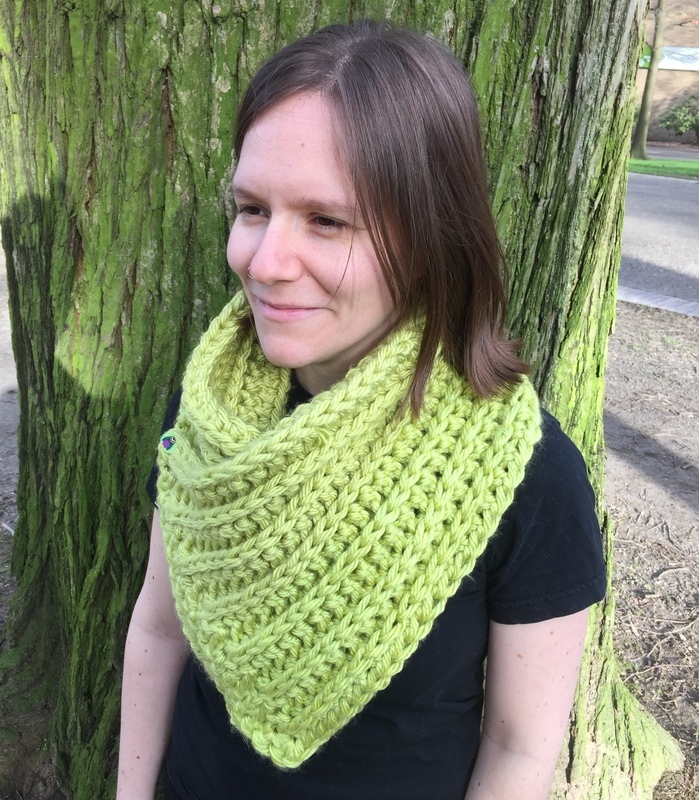 It is a free pattern and I knit it in Tosh Chunky in Jade color way. The one on the bottom right is Sand Bank by Justyna Lorkowska and it was also knit with 80/10/10 worsted in Tannenbaum. Stay tuned for the next post, where I’ll show you tons of pictures of the shawl at the top of the pile, perfect for spring. 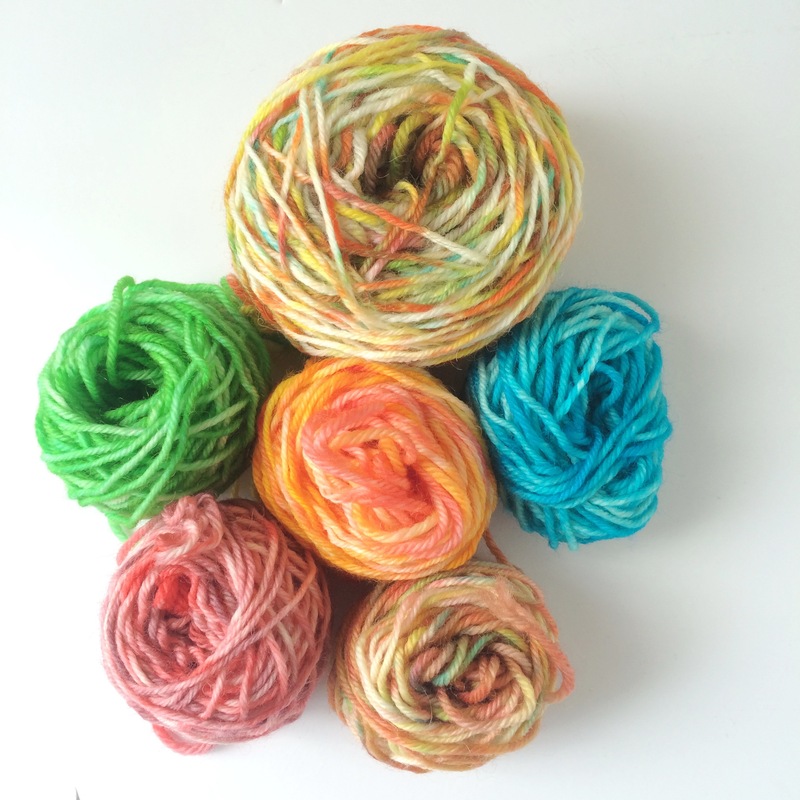 In the meantime, treat yourself to a skein of Madelinetosh, you’ll thank me later! 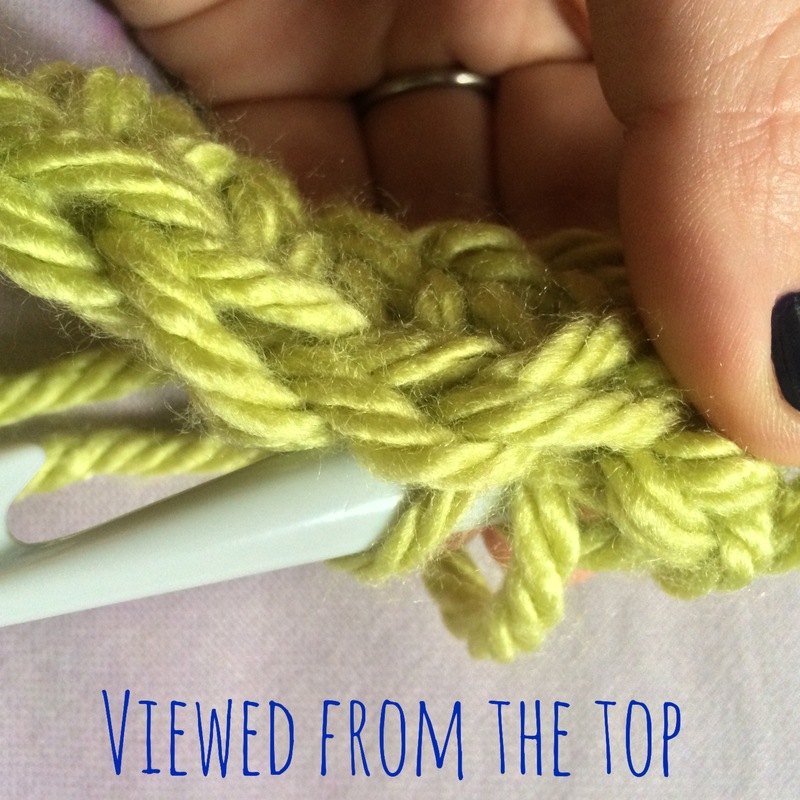 Today we’re talking about crocheting in the third loop. 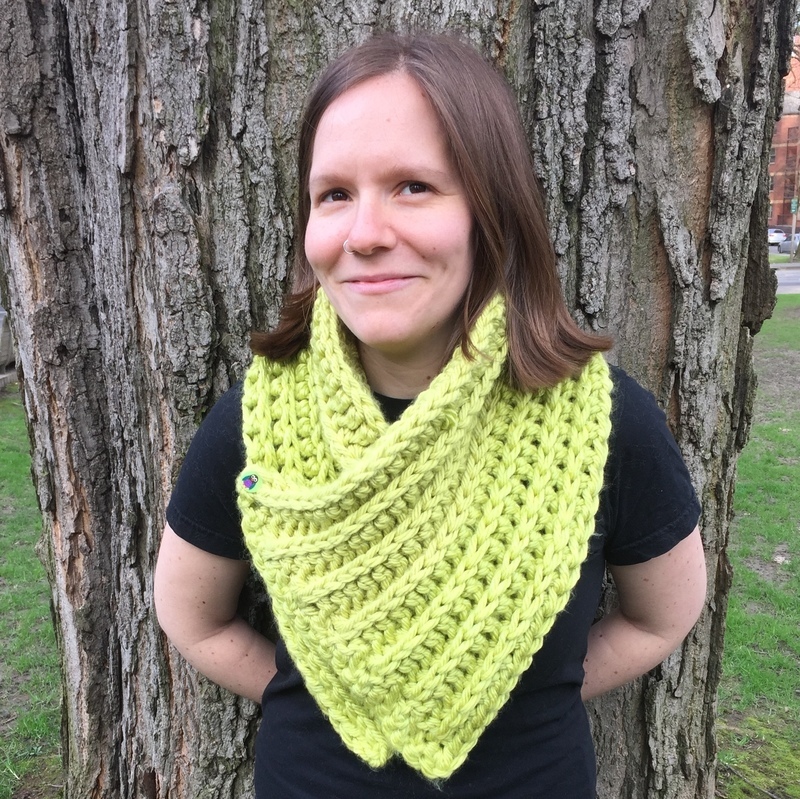 This technique is great to achieve a ribbed look and it comes with a free pattern for a chunky, warm and cozy cowl. 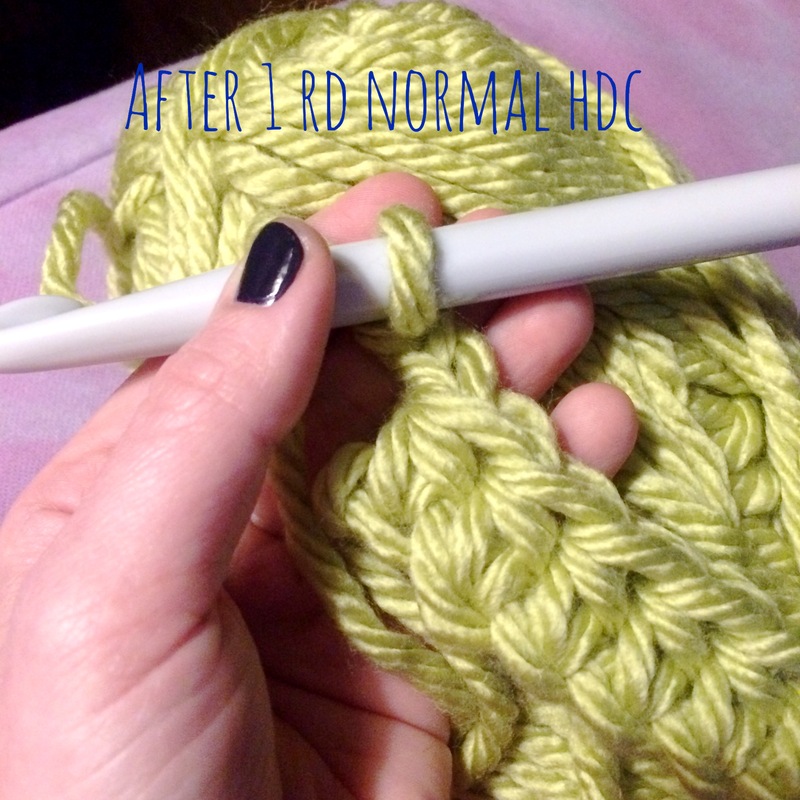 First, let’s talk about Crochet in the third loop! or rather, let’s visualize how to accomplish it, step by step! 3. 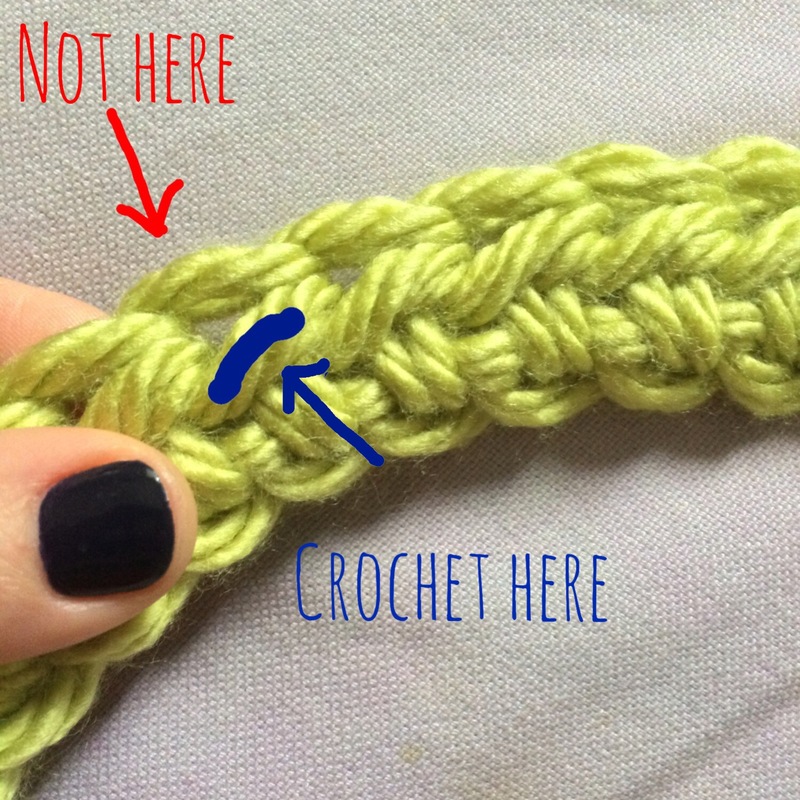 Just to emphasize, you will not crochet at the top loops as you would normally do. 6. 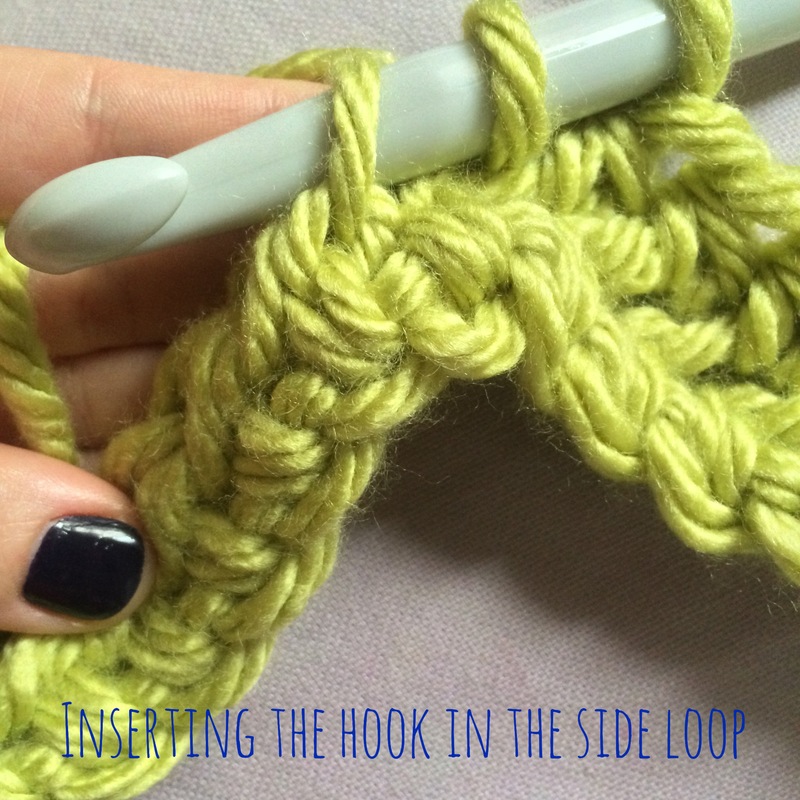 Finish your stitch as usual, wrapping the yarn around the hook once more and pulling it through all remaining loops. You are now done! Now let’s go for THE PATTERN! Repeat for another 13 rows. You will now have 7 ribs in your cowl.